The Original Fiat 500 is a car produced by the automaker Fiat of Italy between 1957 and 1975, marketed as a cheap and practical town car. Measuring only 3 meters long and powered by a tiny 479 cc two-cylinder air-cooled engine, the 500 redefined the term “small car” and is considered one of the first city cars. 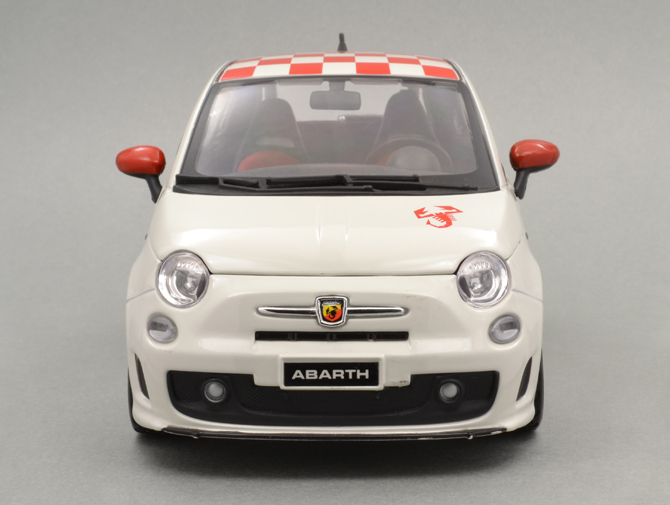 In 2007 Fiat launched a similar styled, longer and heavier front wheel drive car – exactly 50 years after the first Fiat 500 was presented. 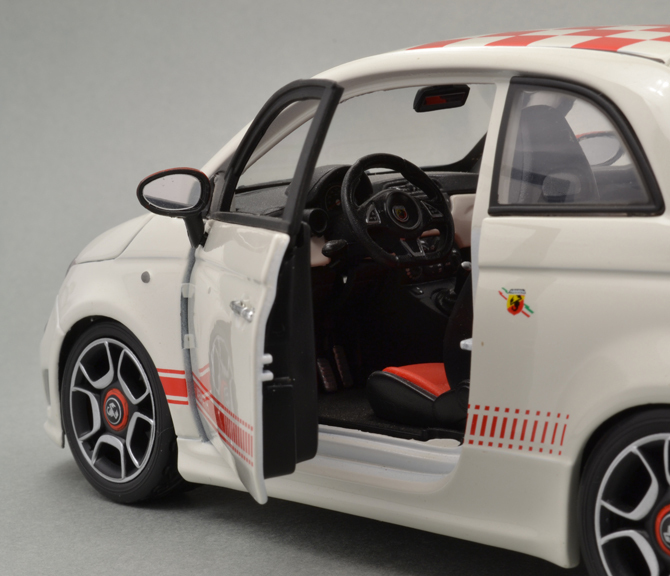 The design of the new 2007 Fiat 500 is based on the 2004 Fiat Trepiuno concept. This car features a distinctive retro-look just like the Volkswagen New Beetle and BMW MINI but is substantially cheaper. 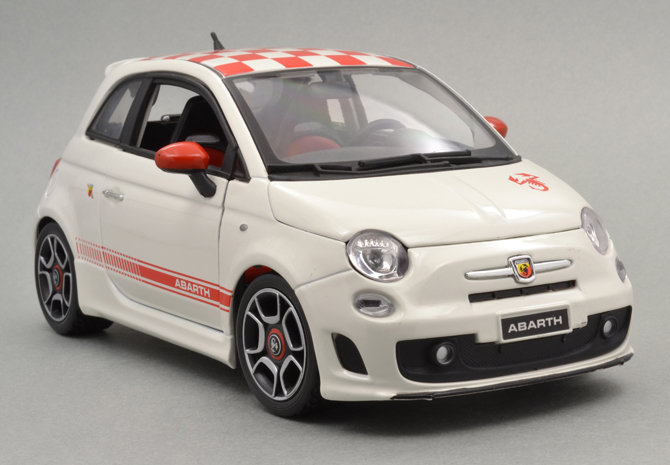 The 500 Abarth is a performance model of Fiat 500 powered by a 1.4l 16v petrol turbocharged engine delivers a maximum 99kW at 5500rpm and peak torque of 206Nm at 3000rpm in Sport mode, and 180Nm at 2500rpm in Normal mode. 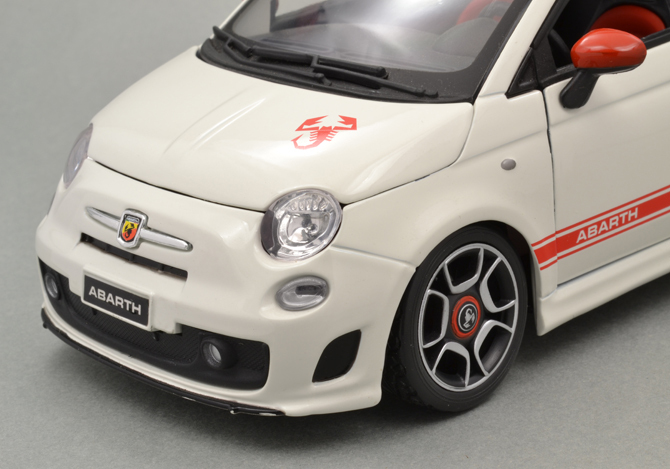 The Abarth package also includes low ride suspension, dualdrive electric power steering with SPORT setting, 6.5 x 16” aluminium alloy rim with 195/45 R16 tires, four-wheel disc brakes (front ventilated). 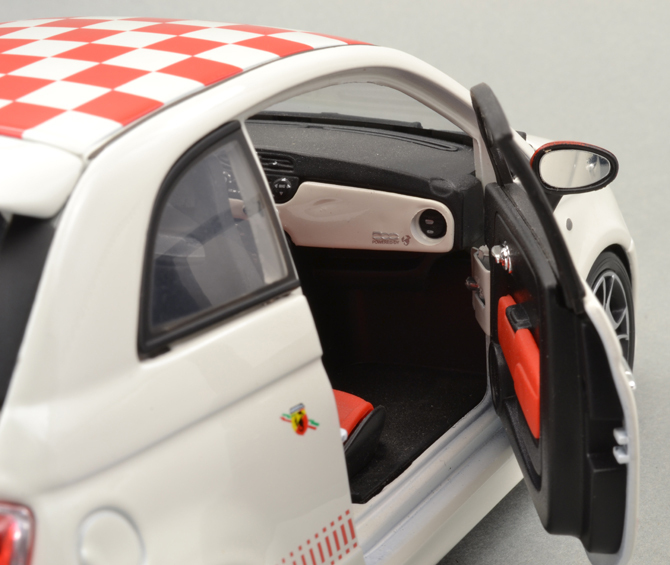 Interior includes turbo pressure gauge, gear shift Indicator, aluminum foot pedals. 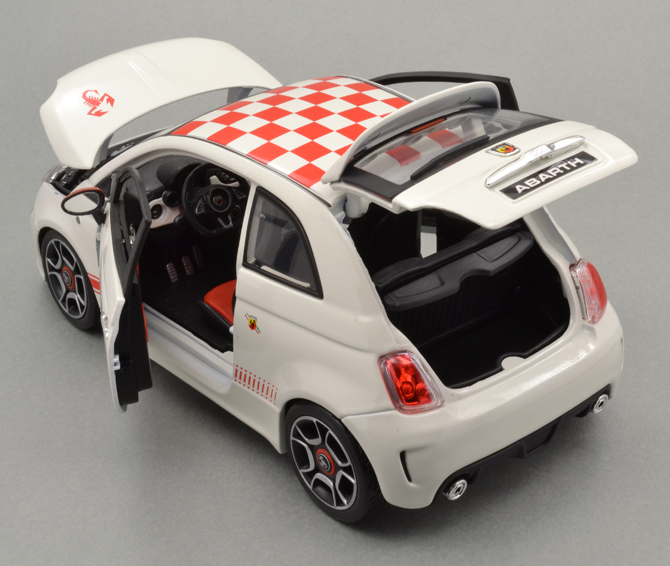 The 500 Abarth Opening Edition (limited production of only 100 cars) for the Italian market includes a option of special stickers including a red chequered flag on the roof (exclusive to the Campovolo Grey shade) that pays homage to the numerous sporting victories of the Abarth brand. 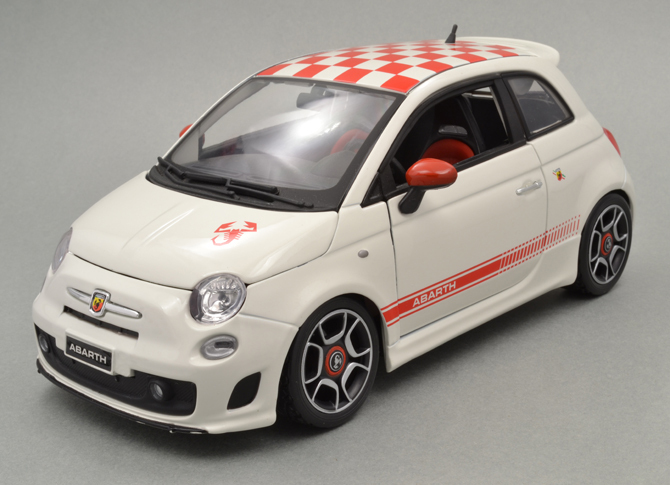 This Bburago made Fiat 500 Abarth is oozing with attitude. At 1:18 scale and costing less than Rs.1500, this is by far a very good value for money model. Every single detail is crafted with precision (a notch above the conventional budget models) and materials used to differentiate texture are wonderful. 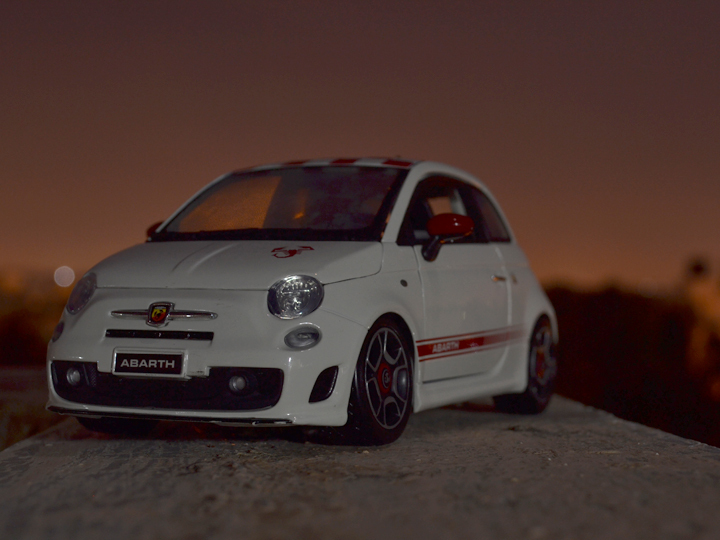 Being an Abarth you would expect some eye grabbing exteriors! The scorpion graphic in red color on the bonnet is something nobody can miss; it is bold and big to command enough eyes. 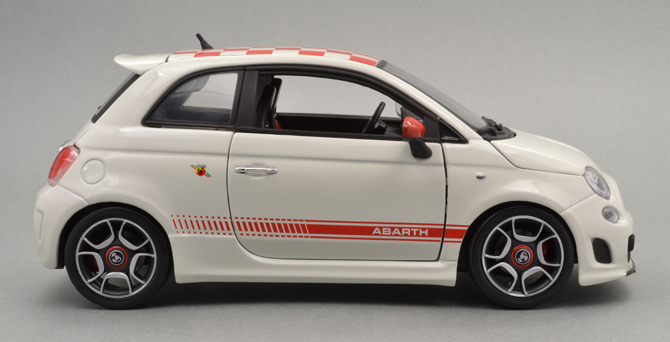 The furious Abarth badge in the center of the chrome strip shouts performance. The low slung front skirts add up to performer appeal. 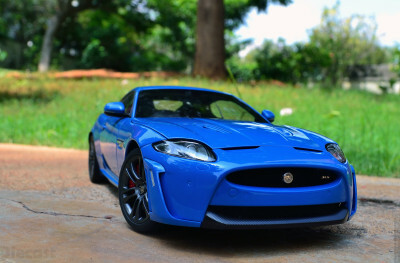 The compact profile of this car was utilized to its full extent! 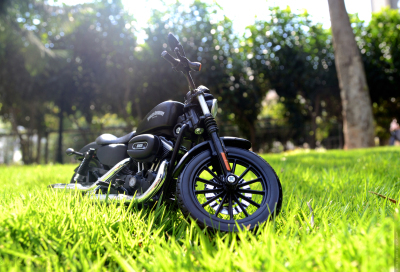 The reduced ride height and the added side skirts enhances the aesthetics of this model. The alloy wheels are exceptionally done with a very sharp imprint of logo. 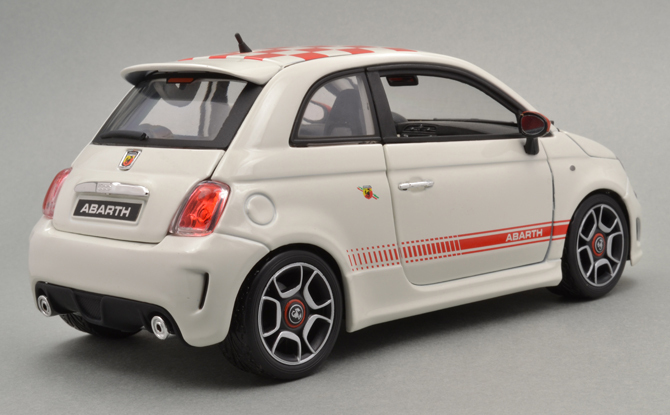 The Abarth badge on the rear fender is multi colored and smudge free, though it is very small. 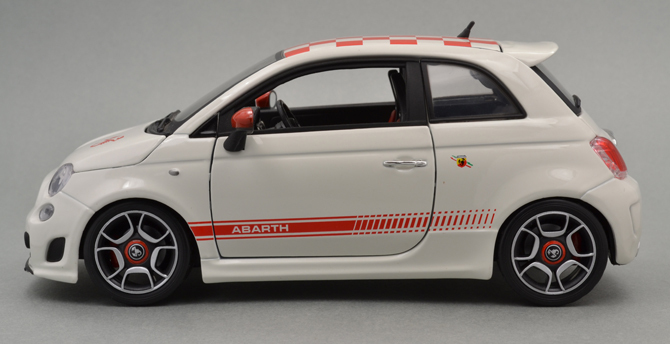 The traditional Abarth strips on the sides are also replicated well in this 500. The only issue, which I could make out is the rear spoiler, which is a kind of mismatched in dimension and it is swept a little upward which is not so realistic. The rear view shows lot of budget brand’s economical touches. The tail lamp unit is not so detailed as expected; the red and transparent separation is not done. The excess space between the hatch door and the body spoils the exceptional looks from some angles. The rear bumper is a masterpiece of this model and the black inset is neat. The chrome tipped exhaust scores a marginal value. 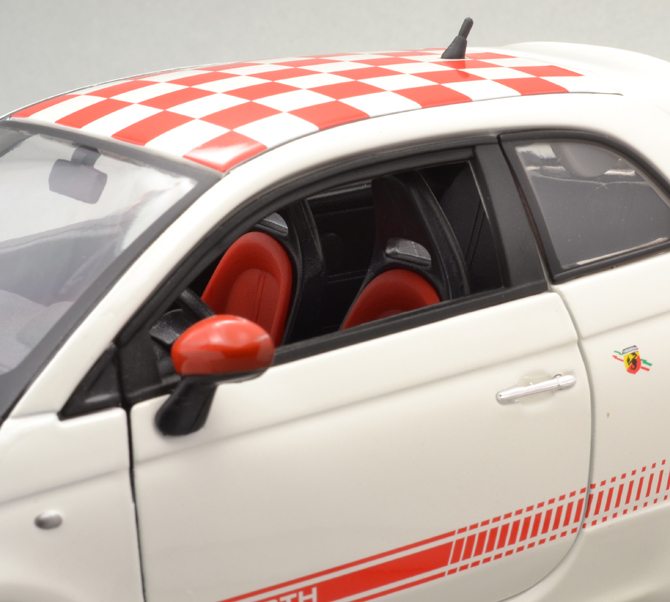 The Abarth badge is wonderful and my favorite window mounted stoplight looks brilliant. 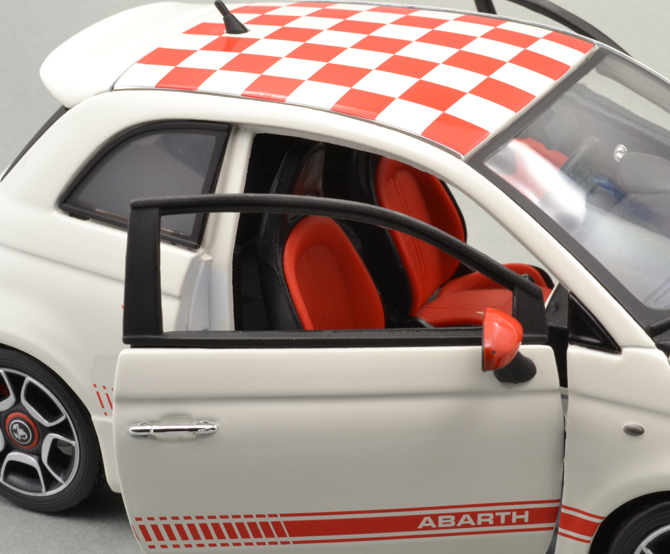 This Abarth feature all the conventional features like doors, hatch and hood open. The steering is fully functional and is kind of spring loaded which locks the wheels back onto its original position. I keep compliant about the door, which open up a narrow space! The hatch and the hood open up fully and reveal the glory inside. 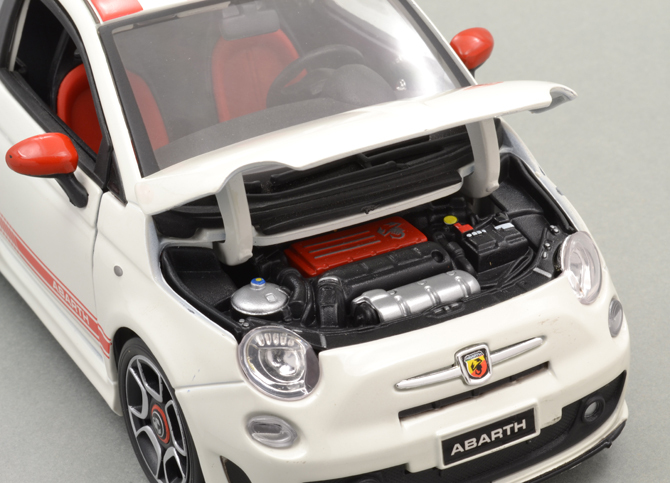 The engine here is nice to look at; the red cover with the Abarth Scorpion just strikes attitude; rest of the engine are nice though show lot of budget model feel. Most budget models now a days comes with some great interiors, this is one of them. The instrument console is brilliant with most of the details like the steering mounted controls in chrome, bold Abarth logo in the steering, chunky gear stick, the handbrake lever and more to keep me busy exploring for days. Unlike conventional makers, the guys in Bburago have made the seats and the upholstery is done with two different materials in color red and black. The doors get a red cladding inside, which enhances the aesthetics. The speaker grills on the doors actually fooled me for real wire mesh and I have to touch it to realize that its crystal clear plastic work. The seats are done with exceptional precision, which is clearly visible on the shape and stitch lines. Do they have a seatbelts? 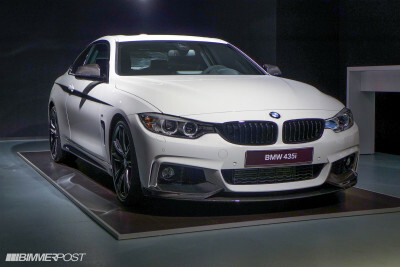 Yes, but almost hidden behind the seats and sticking onto the B-pillar. Author’s Pick: When I got this model right of the shelf, I was very very excited to open it as all the model I had before this are Maistos. On opening the box I was blown sky high, the details are great, a little bit heavy and felt like a premium model (which I feel still today). This guy posed huge challenge as he is white and the conventional background is also white. So got to work on grey to get the details out of this guy. 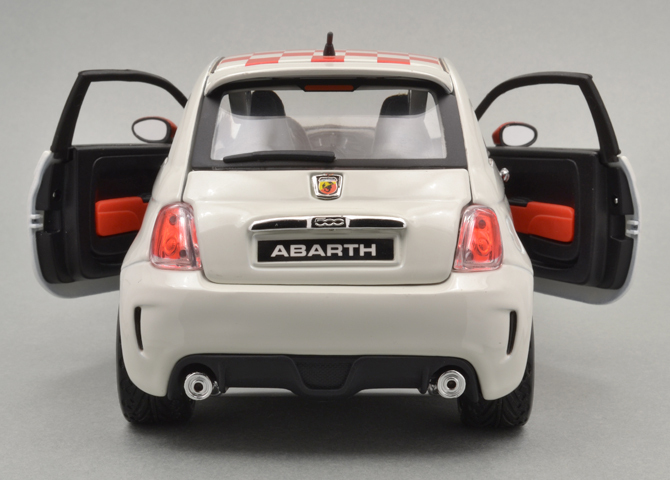 The photo with the doors opened and showing the rear is my pick as it shows attitude and compactness of the super min Fiat. 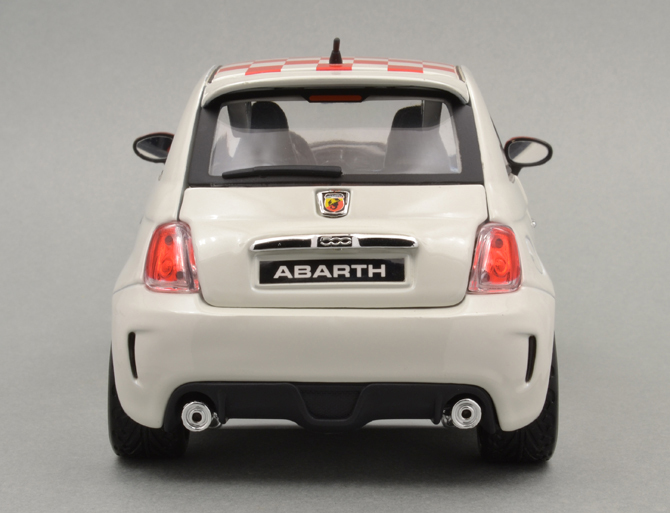 great site on diecast models! found your site after I bought a 1:18 reventon from bburago and a 1:18 SLS AMG by Maisto and is premium edition. any idea whats the difference between a normal and a premium edition besides the garage? What I see as a collector is the “display stand and Maisto Showroom Display packaging”. The Display case can be stacked over other to make a showroom kind of display.